Samsung decided to skip the Snapdragon 810 this year and both the Galaxy S6 and the Galaxy S6 edge came with the company’s Exynos 7420 processor. Several rumors have claimed that the Galaxy S7 and the Galaxy S7 could use both the Snapdragon 820 and the recently announced Exynos 8 Octa 8890 processor. Rumored model numbers for both variants of the handsets powered by either processor have now appeared online. As per this list the Galaxy S7 (SM-G930) and the Galaxy S7 edge (SM-G935) will be available with either the Snapdragon or Exynos processor depending upon markets and wireless carriers. The Snapdragon 820 powered models are listed for China (SM-G9300, SM-G9350), Verizon (SM-G930V, SM-G935V), Sprint (SM-G930P, SM-G935P) and US Cellular (SM-G930R4, SM-G935R4). It’s interesting to note that all of these are apparently destined for CDMA carriers. 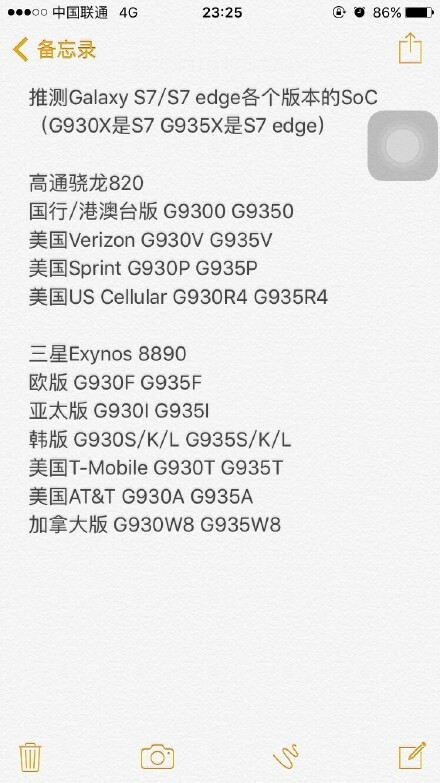 On the other hand the Exynos 8 Octa 8890 is supposedly going to power the international unlocked models (SM-G930F, SM-G935F), T-Mobile (SM-G930T, SM-G935T), AT&T (SM-G930A, SM-G935A), Canada (SM-G930W8, SM-G935W8) and and Korean variants (SM-G930 S/K/L, SM-G935 S/K/L). All of this comes from an unofficial source so it can’t really be considered absolutely true at this point, even though the model numbers pretty much follow tradition, but we’ll have to wait for a bit more information to be really sure about them. where is G Variant ?